Moonstone, one of the longest lasting alternative publishers on the comics and new pulp scene, has been producing quality books meant to be read, for almost 20 years. What started out as an avenue for some projects to get published that had a home with a publisher that never got off the ground, the once reluctant little company that could, continues to find new ways to get under-served characters and readers back into the fold. Moonstone has been the home of many familiar properties like Kolchak the Night stalker, The Avenger, Buckaroo Banzai, Zorro, The Green Hornet, The Phantom, and so many more. It has been the home for many a wayward hero who had not seen the public spotlight as much as they deserved. From comics, to novels, to prose anthologies…everything “from the dark side…to the light”, Moonstone has had the distinct honor to work with some of the top creators in comics and prose, over 1000 storytellers worldwide. We thank them all, as their interest in what we do really fuels the engine. 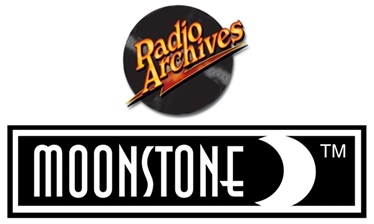 The relationship between Radio Archives and Moonstone goes back many years, as the two companies have worked together on small projects before. This will be the first all out effort between them. The time is right for audio. It’s a field of specific knowledge and experience, something that only Radio Archives can bring to the table. With all of the niche characters that Moonstone has produced: from TV, to pulps, to radio, there is only one logical home for its audio side of the moon. Production on Moonstone's extensive back catalog of books and new books will begin immediately. Moonstone Audiobooks will be available as audio downloads primarily via Amazon, Audible and iTunes.